A: In accordance with the consensus reached between the Chinese and US leaders in Hamburg, the first round of the China-US Comprehensive Economic Dialogue will be held in Washington, the US on July 19. Vice Premier Wang Yang of the State Council will co-host the meeting with US Treasury Secretary Steven T. Mnuchin and Commerce Secretary Wilbur Ross. Following the agenda agreed by the two sides and in response to the needs of the China-US economic cooperation, this round of dialogue will focus on macro-economic policies, trade cooperation, investment cooperation and global economic governance. The two sides will explore effective ways to expand cooperation and properly handle differences and promote the development of China-US economic and trade relations in a strong, balanced and sound way. Talking about the China-US economic ties, of course we would like to see one breakthrough after another. What is more important is to maintain the sound and steady growth of China-US economic and trade cooperation which in nature is for mutual benefit and win-win results. Forty years have passed since the two countries established diplomatic relations. The economic ties between the two sides are getting closer and closer. More and more people have derived benefits from China-US economic and trade cooperation, so have the business sector and the growth of the global economy. This is decided by the market as well as the common interests of the two peoples. As the economies of the two countries converge to a greater extent, some differences and frictions are unavoidable. The two sides are fully capable of working them out properly though dialogue and consultation while striving to elevate the level of cooperation and expand all-around practical cooperation on the basis of equal treatment and mutual respect. On the eve of the Dialogue, Vice Premier Wang Yang delivered a keynote speech at the China-U.S. Business Luncheon in which he made three conclusions. The first is that cooperation is the only right choice for our two countries. The giant ship of China-U.S. economic and trade relations is sailing on the right course. The second is that China's development and progress is a long-term certainty, which offers the most important external environment for foreign businesses to work with China. The third is that there is no limit to the growth of the Chinese market, and China-U.S. business cooperation holds out a promising future. Q: On July 18, the United States State Department issued a statement, saying that Iran is complying with the terms of the Joint Comprehensive Plan of Action (JCPOA) and the US will continue with its nuclear-related suspension on Iran following the JCPOA, but it is in violation of the spirit of the agreement by developing ballistic missile program and supporting terrorism. 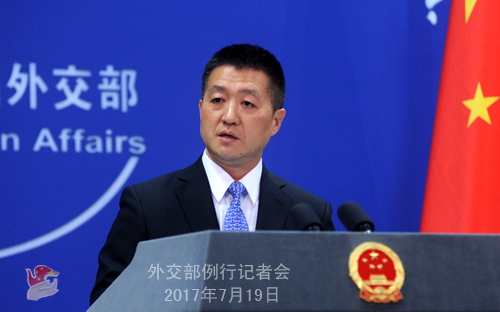 On the same day, the US announced unilateral sanctions on 11 Iran-related entities and 7 people, including Chinese private businesses and individuals. What is your comment? A: We have noted relevant statements made by the US. The JCPOA, born out of multilateralism, is an example of peacefully resolving the international hot-spot issue, including the proliferation issue, through political and diplomatic means. Over the past two years since the deal was reached, Iran has been conscientiously implementing the nuclear deal, and economic and trade cooperation between Iran and various countries have been strengthening. This correspond with the will of the international community, and all parties are obligated to preserve and implement the deal. Meanwhile, I must stress that effective international cooperation depends on mutual trust between relevant parties. 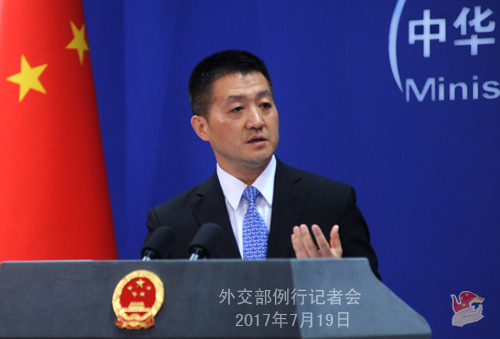 China firmly opposes all forms of proliferation activities, and has been strictly fulfilling its international obligations and promises. As has been reiterated many times, we oppose the so-called "long-arm jurisdiction" imposed by any country based on its domestic laws which will not help enhance mutual trust between relevant parties and the efforts of all parties to resolve international hot-spot issues. Q: Will China and the US discuss economic aspects of the Korean Peninsula issue, for example, China and DPRK trade? 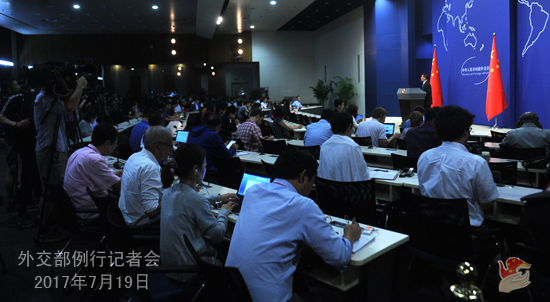 A: I have said that according to the consensus between the two sides on the first round of the China-US Comprehensive Economic Dialogue, several main aspects will be discussed. They will discuss macro-economic policy, an area which has seen close coordination between China and the US as the world's top two economies, as well as trade and investment cooperation which the business circles of the two countries are very interested in. Issues relating to global economic governance will also be featured. That said, as usually happens when high-level meetings occur between China and the US, the two sides might exchange views on issues of mutual interest. As for the Korean Peninsula issue and those related to that, they were featured prominently in the first round of the China-US Diplomatic and Security Dialogue held last month. I cannot prejudge whether these issues, including China-DPRK trade relations, will also be raised this time, since the Dialogue starts tomorrow. But in principle, I want to stress that China and the DPRK, as two neighbors, maintain normal trade relations, which is beyond reproach and not in contradiction with the international obligations China undertakes in line with the relevant resolutions of the UN Security Council.